As Volvo Dun Laoghaire Regatta 2017 reaches its halfway stage, overall leaderboards are shaping up across 35 racing classes. The so far light wind seventh edition of Ireland’s biggest sailing event has produced some impressive performances on the water where in some classes leaders are counting straight wins after two full days of racing. The scene at the port formerly known as Kingstown yesterday afternoon could easily have been an early etching of the first sailing regatta at the 200-year old harbour: traditional classic and modern boats racing side by side with the iconic East Pier lighthouse as the backdrop. Although light airs appeared set to ruin the opening day of the Volvo Dún Laoghaire Regatta yesterday, a growing breeze allowed a full racing programme to be sailed with a mixture of sunshine and rain at times. 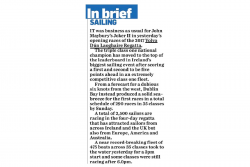 It was business as usual for John Maybury’s Jocker II in yesterday’s opening races of the 2017 Volvo Dún Laoghaire Regatta. 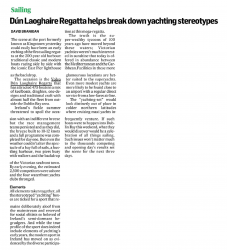 THIS is the largest Regatta in Ireland and on the Western sea board of the British Isles,” Tim Goodbody, Chairman of the Volvo Dun Laoghaire Regatta 2017, tells Gazette- Sport, confirming it is all hands-on deck for this biennial event. 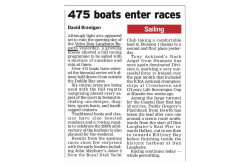 Two sailing regattas this week, on opposite coasts, have succeeded in mustering a large proportion of Ireland’s boating community. And both, in turn have their own spectacles on offer although for different reasons. 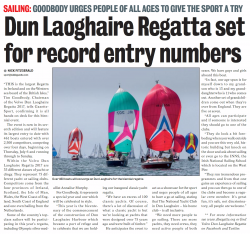 On Dublin Bay, the biennial Volvo Dun Laoghaire Regatta begins this afternoon with an official turnout of 475 boats although this is widely predicted to top 490 entries when latecomers are facilitated. 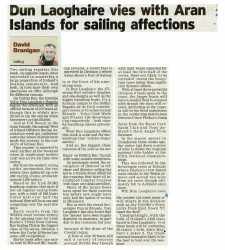 And at Cill Ronan in the Aran Islands, the annual West of Ireland Offshore Racing Association week got underway yesterday where 45 boats have made the journey to the outskirts of Galway Bay. 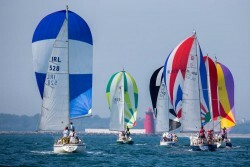 Volvo Dun Laoghaire Regatta early bird entry closed on Friday, reaching 400 entries for the July event. Entry remains open but without the discounted rate. 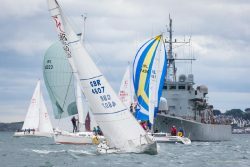 2,500 sailors are expected to race across 22 classes making it Ireland’s biggest regatta but also one of Ireland’s biggest participant sporting events when the first gun fires on July 6. 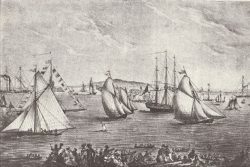 Construction started in 1817, yet it was maybe all of twenty or even thirty years before the basic shape of the harbour as we know it today had been finally created. But in 1821 there was enough of a new pier in existence for King George IV to visit and re-name it the Royal Harbour of Kingstown.